We may already have what you need. An author or title search will probably be the fastest way to search for a known book. If we do have it, just write down the location and call number and go check it out! What if the book you need is checked out? 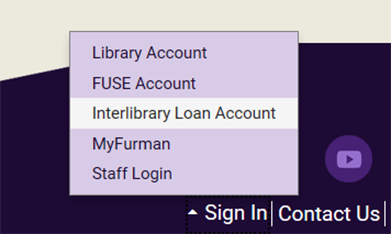 What if Furman doesn't even own the book you want? Fear not! The first place to check is PASCAL Delivers. Just look for the icon in the catalog or search their catalog. The video below will show you how to complete the request. If PASCAL can't deliver, then use our Interlibrary Loan service. Just complete the online request form through your account. You can always access the forms and create an account from the "Sign In" link located on the bottom of every page on the website. << Previous: get the full-text?